These salted butterscotch blondies are fudgy, chewy, and everything you’d want in this classic treat! First and foremost, for the marathon that is first baby Labor & Delivery (obviously), but, perhaps more importantly, ALSO for the madness that is The.Boy’s family’s annual Easter Egg Hunt. I have a two year winning streak to uphold and I refuse to let anything (including an extra large baby bump) get in my way. As an aside, if you would like to see a multitude of extremely grown individuals running around my in-laws’ front lawn in search of Easter eggs with a level of maturity that barely surpasses that of five year old children, then feel free to come to Marlboro NJ on Easter Sunday. And don’t even get me started on the marathon that is Easter baking!! Honestly, I think Easter has way more baking traditions for me even than Christmas. Strange, but true. There’s the traditional Italian Easter bread and the Easter grain pie and the pizza rustica and the delicious little honey balls that I can never remember the name of…not to mention the gazillion Greek Easter food traditions that I’ve gotten to inhale with reckless abandon since marrying into Greek culture. It’s all. just. so. good. And on top of that, there are Easter blondies. AKA ANYTIME BLONDIES!! But they are, in my opinion, extra perfect for Easter because they travel well, they are great for crowds, and somehow the fact that they’re so delectably vanilla and deceptively light makes them seem perfect for spring. I can’t really put my finger on it, but it’s just true. Everyone probably has a recipe for blondies at this point, and I have tried quite a few myself over the years, but this is the recipe that I keep coming back to as my own personal favorite and BEST. They are ridiculously simple, even more absurdly fudgy/chewy/delicious, and also so amenable to adaptation. It also requires the most basic of basic ingredients that you are absolutely guaranteed to have on hand at all times. And if you don’t have them on hand, well, you should. It is freshly milled from organic hard red wheat and is not enriched with any additives. Knowing that it comes from such high quality ingredients is so important to me. It is used by professional bakers EVERYWHERE to make everything from well-textured loaves of bread to light and airy baked goods to (as you see here) fudgy blondie heaven. It makes EVERYTHING. TASTE. GOOD. Want to get some Bob’s Red Mill into your own baking? Check out these coupons to get a discount on your next Bob’s Red Mill purchase! These salted butterscotch blondies are fudgy, chewy, and everything you'd want in this classic treat! Heat oven to 350F. Line a 9x13-inch baking pan with parchment paper or aluminum foil and grease. Set aside. In a large bowl, whisk together the melted butter with the brown sugar until smooth. Mix in the eggs and vanilla bean paste until well combined. Stir in the salt, followed by the flour, mixing until just combined. Pour the batter into the prepared baking pan, spreading into an even layer. Bake for 15-20 minutes, or until the middle is just barely set. Remove from the oven and let cool in the pan on a wire baking rack. Sprinkle with sea salt before serving. Swoon … your blondies look to die for! And good luck with that training. Somehow, I think I’d put my money on you. Somehow blogger hasn’t been showing me your posts – I’d missed that you were pregnant! Congratulations! These blondies look delicious. Ok, that Easter egg hunt sounds like a ball! Especially one with an extremely pregnant lady running around. You’ll kill it. I have faith. 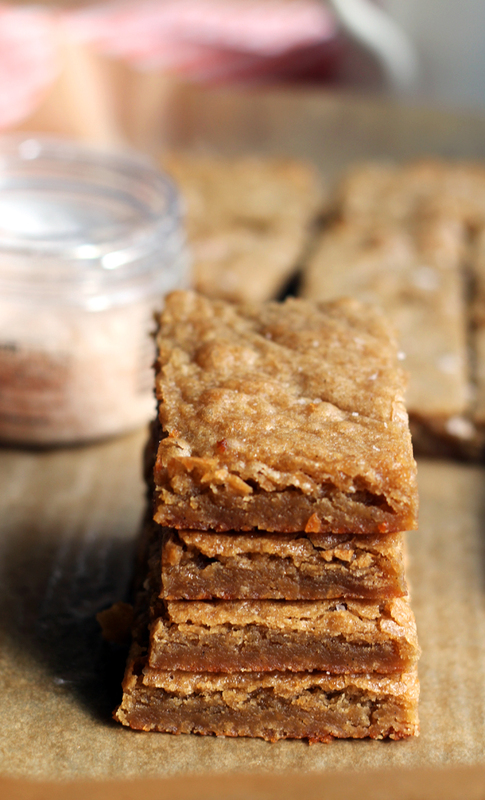 And these blondies sound daaang good too! Yum, yum yum! Just think. Never year, at this time, you’ll have one more family member to add to all the excitement on Easter Sunday. I love blondies. I can see that chewy center..just a tad under baked, and exactly the way they should be. Other than my beloved King Arthur Flour, Bob’s Red Mill is my other place to look for quality ingredients. (Ina Garten would be so proud of me.) Got my coupons printed! I recently made some chocolate chip blondies that were very unimpressive. These look way better. These are just what i need right now. I’m usually more into savoury but i have a huge sweet tooth right now. Let us know how you get on with the easter egg hunt! Joanne these look incredible! 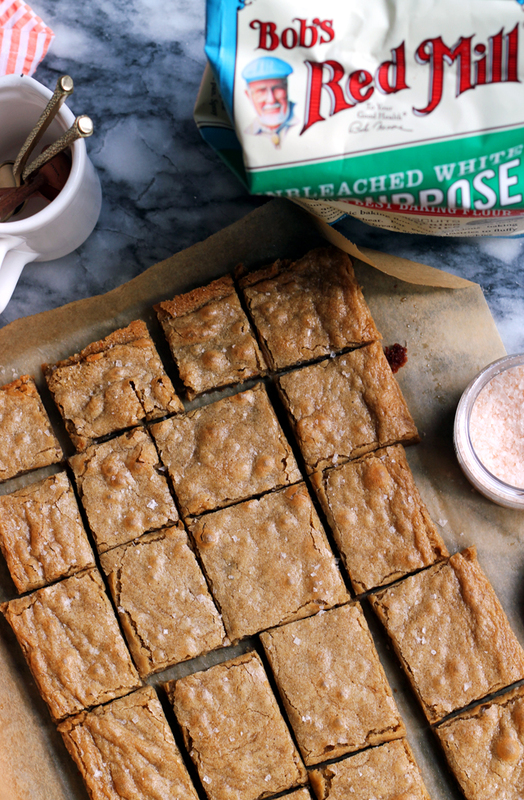 I love the simplicity of blondies, perfect for anytime cravings. You are going to ROCK that Easter egg hunt I’m sure haha. I love the image of you running around with your cute bump searching for Easter eggs! My husband is obsessed with butterscotch blondies (I think because his mom made them often) so I will definitely give these a try. I can’t believe you’re having a BABY soon. I’ve been reading your blog since before you met the.boy and I’m so excited for you!!! 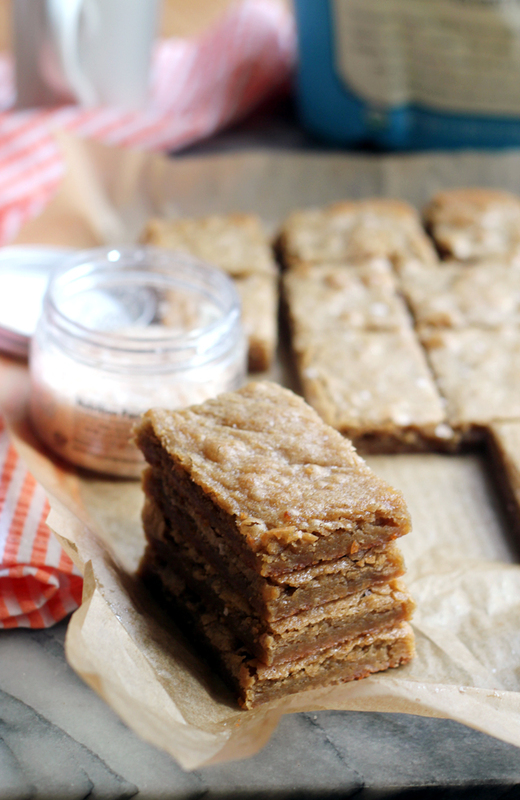 Wow, these blondies look epically delicious! So chewy and full of flavor. That sounds really fun to see adults going at an Easter egg hunt with so much gusto…good luck continuing your winning streak! what an awesome easter tradition! love it 🙂 these blondies sound perfect too! Ha ha, the annual Easter Egg Hunt sounds like a blast. We do an annual Easter Egg scavenger hunt at our house. 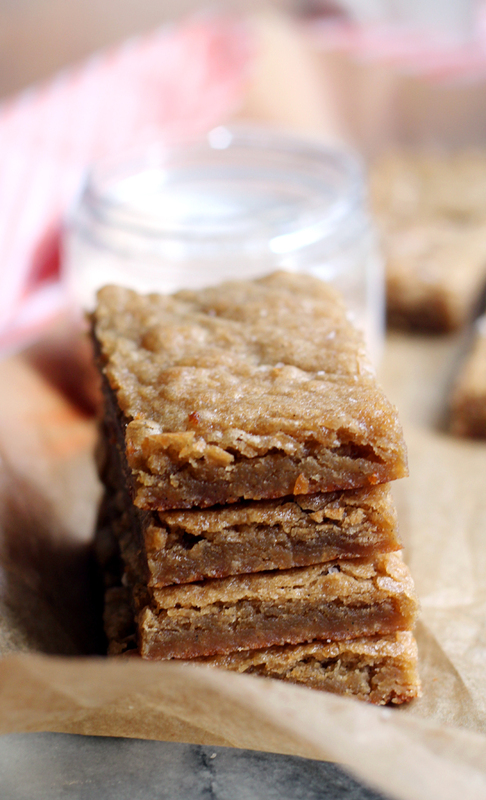 I do believe these blondies will be making an appearance at Easter brunch too. I’m always a fan of quick and easy! I put no age limits on Easter egg hunting. Or baking limit on Easter goodies. Blondies are my all time favorite and these sound so good! The blondie recipe looks great. However now I am dying to try your recipes for Easter Grain pie,pizza rustica and delicious honey balls. Can I get those please???? 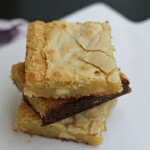 These blondies look amazingly delicious and addictive! I love that you all run around hunting Easter eggs. Hope you win! 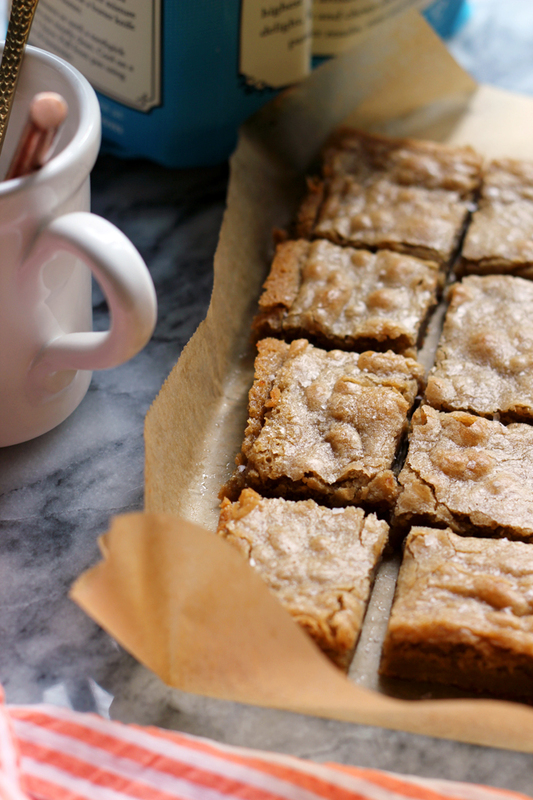 The blondies look delicious – simple & perfect. Im wishing I could witness your Easter Egg hunt – it sounds like a barrel of laughs! BTW – these blondies look delicious! These blondies look fabulous! Love the salty sweet play here and how dense and full of butterscotch flavor these are 🙂 Pinning! Hah! I was just thinking that I’ve never really participated in an easter egg hunt before and how I wished there was one for adults! Do you think you can let me join yours?! Kidding! These blondies look divine, Joanne! 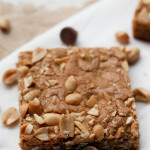 I love blondies – these look awesome. Ah man these look so beautiful! 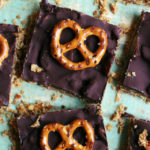 I love brownies but can’t resists a good, chewy blondie as well! Keeping this recipe on hand! The Easter egg hunt sounds like fun! These brownies need to become a new Easter tradition for my family! They look so good! Wow your blondes look wonderful! Good luck with your training! We can’t wait for the big day! xoxo Have a great weekend! We love Bob’s Red Mill products. Have you tried their grits? Living in the south now I have tried the local foods and for a gluten free product , these grits are fantastic. Love the idea of you running around with the baby bump, grabbing up eggs! I’d love one right now with a cup of tea! Looks wonderful, congrats on your pregnancy! I have total faith that you are going to win both the Easter egg hunt (even with baby bump!) AND blondies!! Oh yum – these sound delicious and they look so moist and yummy. Bring on the Easter baking! 1-I love Bob’s Red Mill and NEED some of that flour! 2-your Easters sound soooo fun! 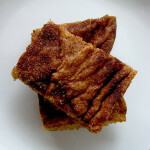 3-yumyumyumyummmmm I love how chewy and salty-sweet delish these blondies look! This is my go-to blondie recipe, too. SO delicious and they always get eaten so fast. I made these for dessert yesterday subbing my gluten free flour blend for the regular flour. The blondies were amazing. Will definitely be making these again!!! Finally got to get to make these! So so so easy – thank you for that! And the final pinch of salt – perfection!! woot! This looks delicious…but no baking soda? I have them in the oven right now and they are not rising at all…. Yup, no baking soda! The eggs help with rising and the lack of baking soda helps keep them super dense and chewy (you can get a good sense of the texture in the picture…almost fudgy).